"Many counsellors who work in primary care find it difficult to explain to colleagues in the primary care team what they actually do with clients behind the closed door of their room. In this book the author brings to life in a gripping way what really does go on when a counsellor sees a patient in the primary healthcare setting. It’s good to read for once a book that describes so realistically and movingly the minute-by-minute account of what actually happens, not a book describing clever therapists getting it right all the time. The book should be required reading for newly appointed non-clinical managers of counselling services and for primary healthcare staff about to start working with a counsellor as a member of their team." "… provides excellent insights into the many issues and challenges that are part of the work undertaken by therapists and counsellors in the primary care setting. … the book is sensitively written and challenges the reader to reflect on key issues involved in the counselling process." "… stresses the importance of supervision and support… However, the most useful concept… is understanding how much can be achieved in counselling sessions for a short period of time." 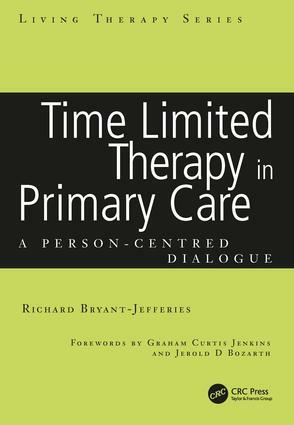 "This innovative text explores and explains a current popular trend in primary care - ie that of 'time limited' counselling therapy. Increasingly we are finding services that start out by stating that therapy will be limited - usually to six sessions. The author presents this reality… in the form of taking a client through each mock session. Throughout the text there are 'explanatory' boxes which allow further consideration of particular issues." The person-centred approach. Time-limited counselling. Counselling in a primary health care setting. Session 1. Session 2. Supervision 1. Session 3. Session 4. Supervision session 2. Session 5. Session 6. Supervision session 3. Session 7. Reflection. Conclusion.